If you don’t have to wear a plain uniform, you’re faced with a sea of color choices and style options when you go scrubs shopping. Do you ever get confused about what goes with what? We’re here to help you not only match your scrubs outfits, but we’re taking it a step further. Consider this: The colors you wear can affect your mood and that of those around you. DO wear white with a bright yellow top if you’re looking for a really fresh look. Yellow is considered a very energizing color that summons sunlight and optimism—maybe just what you’re looking for when you’ve got a long shift ahead of you! DON’T mix too many bright colors. If you wear yellow, especially if it’s a brighter shade, you might want to make sure the other part of your scrubs outfit is a bit more muted in color, such as a dark green. And be sure not to confuse ‘sunny’ yellow with ‘caution’ yellow! DO treat blue scrub bottoms like a pair of jeans when choosing a top—there are so many fun colors that will look fantastic! 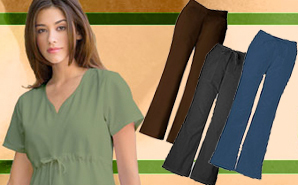 Lighter shades of green and violet look terrific with darker blue scrub pants, and if you’re really into orange, wear a top of that color with blue scrub pants. Blue is identified with calmness—perhaps a perfect color to wear on a busy day. DON’T go for just any orange colored top to match with your blue pants. While deep orange adds excitement, bright orange can look cheap. DO wear black scrub pants or tops. You can never go wrong with any other color you choose to go with them. One of the trends in fashion this season is pairing black with colors such as purple, gray, bright green or bright blue. DON’T, however, earn yourself the monicker ‘goth nurse.’ Wearing too much black day in and day out can look empty and depressing to the nurses and patients around you. DO add green to your wardrobe. Green is associated with growth, vitality and openness and can positively affect those around you. Good options to wear with bright green include brown, dark blue and more muted shades of red. DON’T choose too many earthy tones as they can be associated with melancholy. Warm shades of brown encourage closeness. DO try a rosy red, soft pink, or violet for a scrubs top as these colors have a calming effect and are easy to match. With stronger reds, you may want to try lighter colors with it, such as light blue, light green or light yellow. DON’T go for a highly saturated blue-red since it can be disturbing in large amounts and possibly increase anger. 6. Which white is right? DO embrace a white uniform as it often signals crisp, clean professionalism to your patients. White also imparts purity and brightness of spirit. DON’T buy a uniform that is blue-white as it can look sterile instead of inviting.